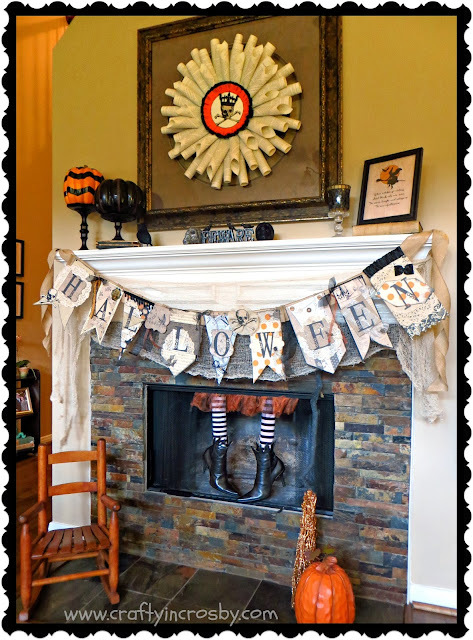 I've finally had a moment to sit down and post pictures of our Halloween mantel this year. 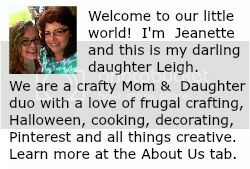 Leigh and I worked like crazy on the new banner, and Leigh and her BFF Christine made the fantastic Skeleton Book Page Wreath. We will post more details on it in October, so come back and check it out. What do you think? We just love it! 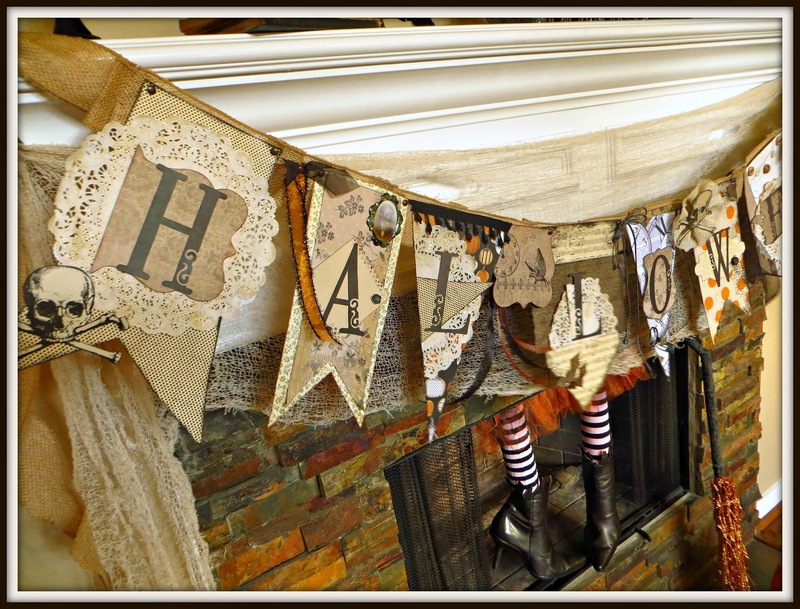 The banner was inspired by the amazing one made by Jen Allyson over at The Project Girl. Ours turned out larger than hers as it was sized for our mantel. Check out Jen's detailed instructions on her blog. We used our Fireplace Witch and Halloween Printable from last year, along with some new pieces that we will be blogging about in October. Leigh wanted things a little more vintage and spooky this year and not so cutesy. I think that we hit the mark! Most of our decorations this year will have this look. I like your style! That banner is awesome... it has many interesting elements too it. Came by because you left such a sweet comment - and so happy I did - most definitely your newest follower! Thanks so much Suzan! I really enjoy your blog too! I just love those hanging boots - hilarious! pretty banner and wreath, too! Well, it was a copy cat craft so we can't take all the credit, but we do love how it turned out! Thanks so much Phyllis! If I only had some friends like your house sitters I would consider my Halloween decorations complete! Thanks Vicki - we love Halloween! 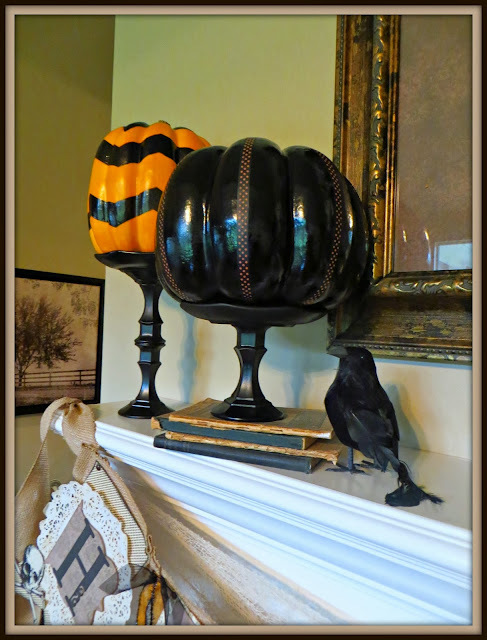 I love this Halloween Mantel. I don't usually decorate for halloween but this is some cute stuff you have :) I came over from the T.G.I.F. Link Party with a Peek Into My Paradise where I am co-hosting. Thank you for linking up! Thanks so much Emily! Following you now via Bloglovin! 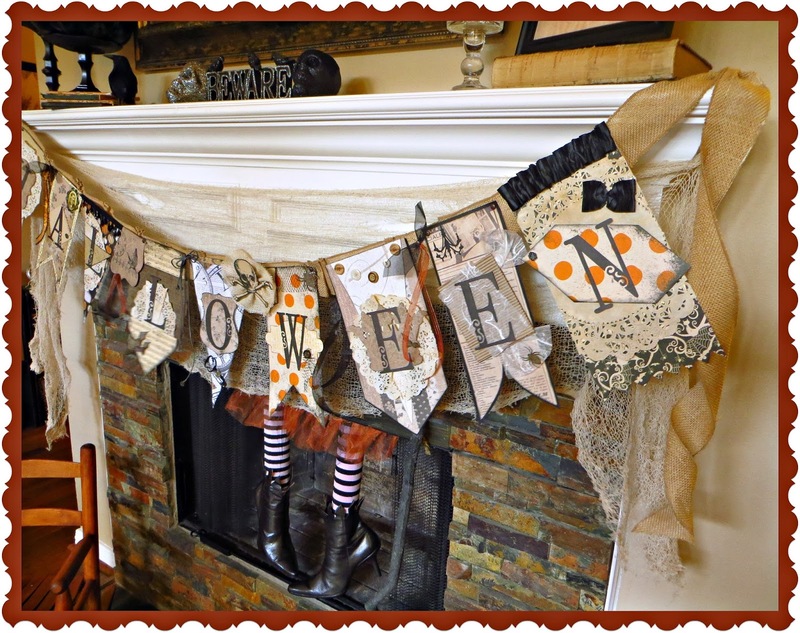 What a great mantel ... the banner is probably the best I have ever seen, which is saying a lot because I LOVE pennant banners, and makes LOTS of them. The witch in the fireplace just made me laugh, dh too .... hilarious!! Thanks for the smile! Wow Pollyanna - we are honored by your high praise! Thanks so much - we think it is our best yet! 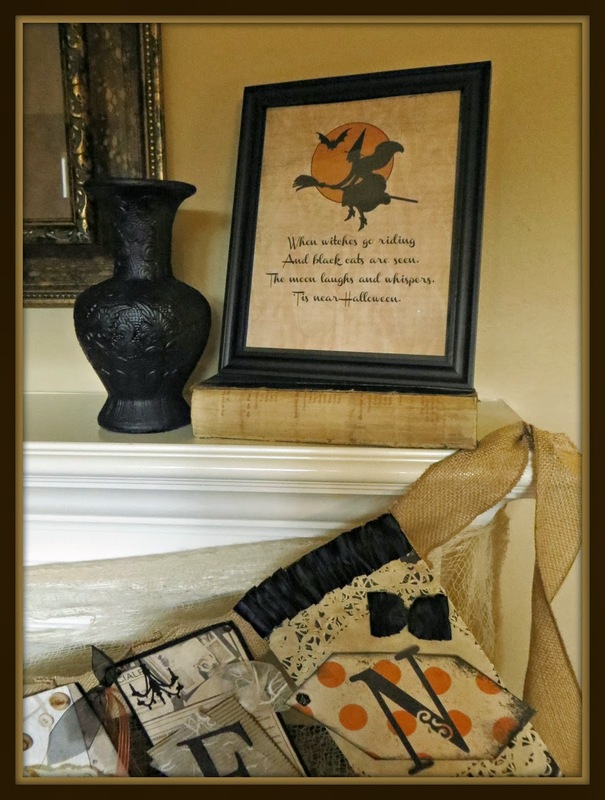 And we just love our Fireplace Witch - she just makes me smile!!! Thanks for stopping in! Oh my gosh! 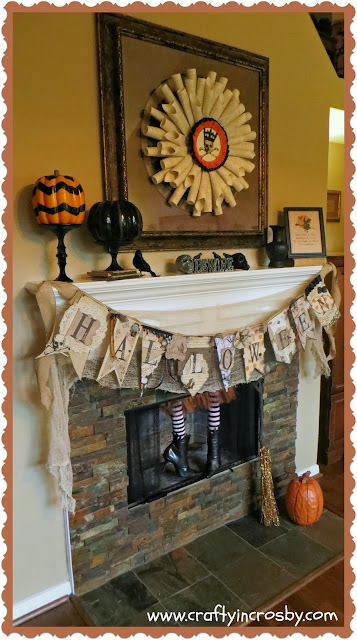 What a cute Halloween mantel. I am loving the witch legs that are coming out of the fireplace. That's a great idea! 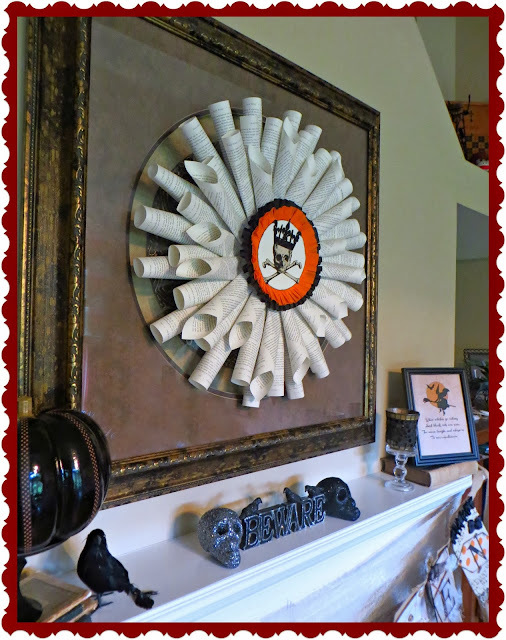 I have really been wanting to make a wreathe for our fireplace and front door and I love how you made yours out of rolled up paper. That is so unique and so cute. Y'all did a fabulous job on this. Thanks so much Ruth. Most of our mantel decorations are copy cats of great pins that we've seen. The witch is my favorite and was so easy to do. Thanks for the invite - we linked up! I love what you have done. You should come show off your creativity at our link party. The party will not be the same without you! Thank you Rhonda! We linked up and I'm following you via Bloglovin too! We like to party! Quite creative and lots of ingenuity! Oh, love the banner and the pumpkins on the stands!! So darling!